Once again, Second Life creators are coming together to help in a crisis as floods continue to damage homes, towns and lives in Queensland. With 19 dead and hundreds of thousands displaced and a swath of floodplain larger than Texas, this is a natural disaster with the need for prompt and generous international assistance. 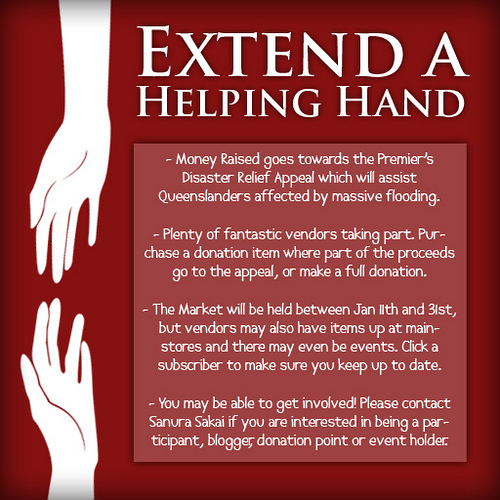 People can choose to donate directly to the Premier’s Flood Relief Appeal, but those who want to shop for charity, they can attend the Extend a Helping Hand event. This entry was posted in Expos, Fairs and Fundraisers, Second Life on January 11, 2011 by Cajsa Lilliehook.